Astronauts on China's Shenzhou VI spacecraft have adjusted its trajectory after it started moving too close to the Earth, state media has said. The operation, carried out late on Thursday, took just a few seconds, the official Xinhua news agency said. The agency described the tweak, during the craft's 30th orbit of the Earth, as a "normal technical operation". Xinhua said the craft had deviated from its planned trajectory because of resistance from the Earth's atmosphere. 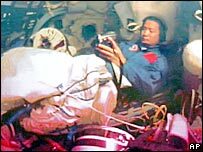 The adjustment, which was carried out by firing the craft's thrusters, altered the spacecraft's altitude by 800m (2,625ft), the People's Daily said. Space experts say such adjustments are routine. Experiments which astronauts Fei Junlong and Nie Haisheng carried out on Thursday to test the stability of the craft were successful, said Zheng Songhui, a consultant for the spacecraft's systems. "The results proved that the spacecraft was fully capable of enduring all the disturbances, and then astronauts would be allowed to move in a relatively free way," he was quoted as saying. The mission is expected to see the Shenzhou VI orbit the Earth for about five days, at a distance of about 340km (200 miles). The re-entry capsule will land in the Chinese region of Inner Mongolia, and the authorities have reportedly warned nomads and herdsmen in the area to watch out for falling objects. 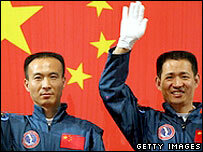 The current mission comes almost exactly two years after China's first manned space flight. Beijing has attached great importance to its space programme, viewing it as a source of national pride and international prestige. China hopes to set up a space station within five years and eventually it wants to put an astronaut on the Moon.